Spend a night in Westeros without the fear of decapitation or incineration. Head to Hawkins, circa 1983, by way of Precinct. Taylor Smith of Lion’s Tail wins the second Boston Bartender Bout. Thirst broadens its scope as Boston’s cocktail community grows and diversifies. Is this your first Thirst? Let me offer you a little advice. 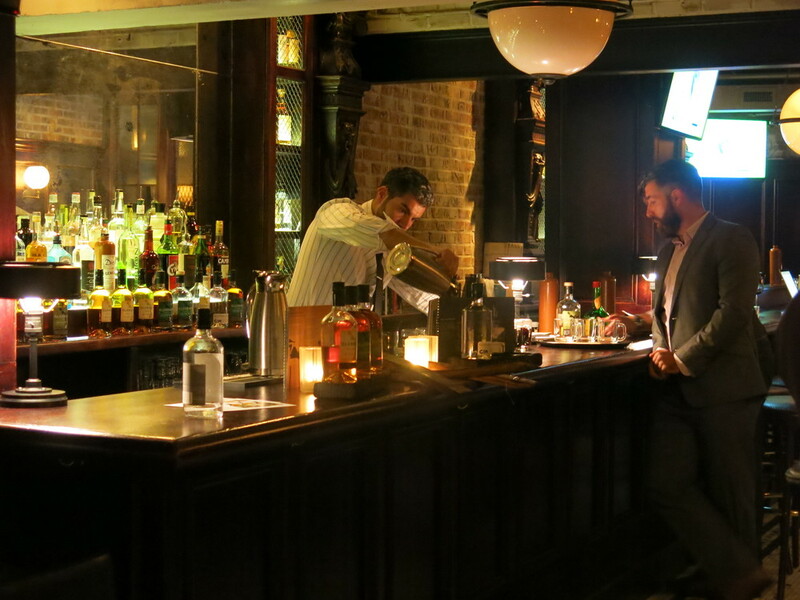 Pastoral's Joe Dugan is the last bartender standing after a four-week cocktail competition. Smoky drinks, fur blankets, and family sigils make a visit to Precinct’s patio feel like a night out in Winterfell. A pop-up bar that recalls the spirit of the Golden Age of Cocktails is in Boston for a limited time. Here's a look at New England's premier cocktail festival. Thirst Boston 2017 is just two days away. Here's a sneak peek. With Fire Puncher Day, GrandTen honors one of the strangest incidents in South Boston history. A look back at a sampling of Gin Lane 1751 at Tavern Road. A look back at Island Creek Oysters' raw bar takeover at Porto. An evening with a Venezuelan rum and a Red Sox legend. Despite the name, there was no violence. And nobody ever asked whether we were ready to rumble. Boston's premier cocktail event is thriving in its third year. 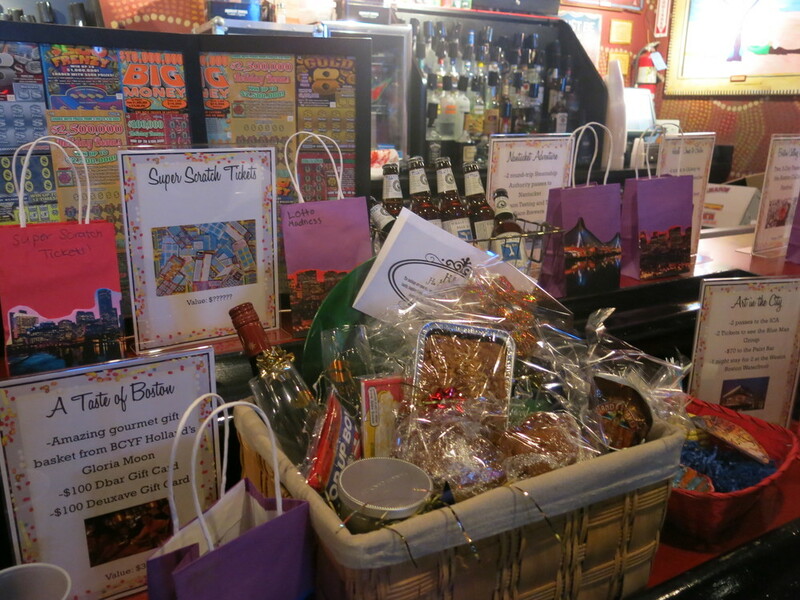 Now in its second year, the competition heats up at Libations for Preservation. What did our colonial forebears drink? And were the kinda lit when they came up with some of their revolutionary plots? Eating, drinking, and dancing, all while raising money for a great cause. Not a bad way to spend a weeknight. 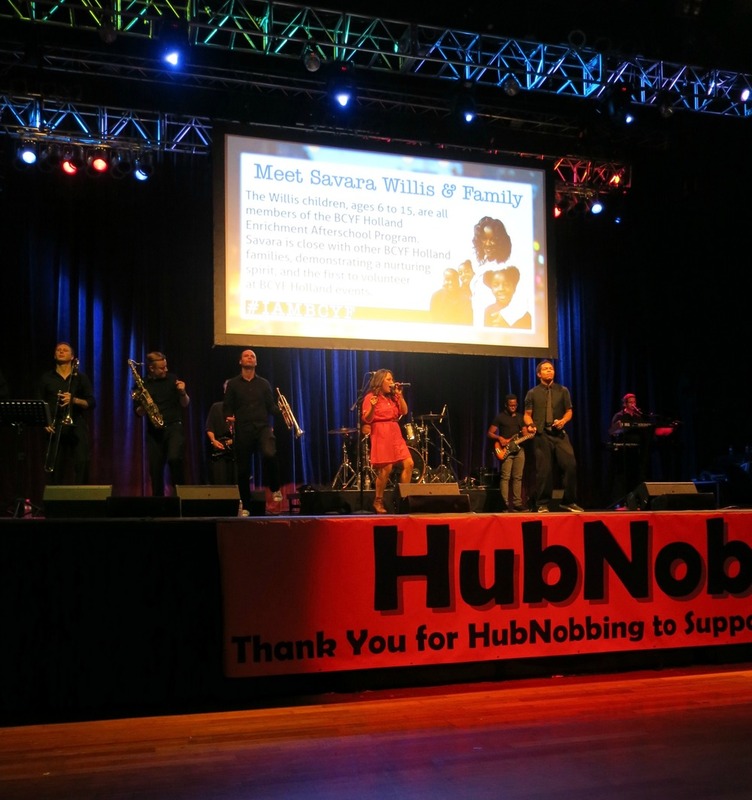 This past Tuesday, the House of Blues served as the setting for HubNob 2015, an annual fundraising event for the Boston Centers for Youth & Families (BCYF) and its nonprofit partner, the Foundation for the BCYF. The BCYF is the city’s largest human services agency, operating a network of community centers and fostering positive opportunities for Boston’s youth and families. HubNob, now in its fifth year, is the foundation’s signature event. It’s inspiring to see a community coalesce around such a meaningful cause. In addition to a capacity crowd that paid between $60 and $100 to attend, many local organizations donated time, services, products, and money to the event, and a number of local luminaries were on hand to lend their support. The festivities began with a VIP reception in the upstairs Foundation Room that featured music by the heavily inked singer Lisa Bello; food by Devlin’s Bistro, in Brighton, and Pikalo, a Jamaica Plain establishment that makes some killer empanadas; and plenty of Harpoon IPA. Jenny Johnson, host of NESN’s Dining Playbook, served as the reception’s emcee and auctioneer. She talked about the foundation, introduced key guests such as BYCF interim executive director Christopher Byner and Mayor Marty Walsh, and auctioned off unique prizes such as a Boston Celtics package that included courtside seats and access to the pre-game warmup. Mayor Walsh spoke at length about the important work that the BCYF does and offered some heartfelt personal tributes to several of the key individuals who have devoted so much of their time and energy to making the organization successful. The main event took place downstairs, and a packed house enjoyed food from a dozen Boston restaurants, including Pastoral, Brahmin, Chicken & Rice Guys, and Crave. On emcee duty was José Massó, host of ¡Con Salsa!, a long-running radio show on WBUR. The evening’s soundtrack came courtesy of Soul City, an energetic 10-piece band that got everyone’s feet moving with a stellar R&B set list. Guests could bid in a silent auction with nearly two dozen unique prizes, including an autographed (and fully inflated) Tom Brady football, Bruins tickets, and a pair of round-trip tickets anywhere that JetBlue flies. Lots and lots of cupcakes. All told, this was a spectacular evening with a lot of energy and a lively crowd. I don’t know what the final fundraising tally was, but given the turnout at both the VIP reception and the main event, it’s clear that a great many people care about the BCYF and are eager to support it. Proceeds of the evening will be used to help the foundation develop new professional and social opportunities for Boston teens. It’s work that never stops, but an event like HubNob is a chance to celebrate BCYF’s success while ensuring that its efforts can continue. Gaining a foothold in the spirits industry is challenging under any circumstances. But when you make Irish whiskey and operate in the shadow of a market-dominating behemoth like Jameson, even getting people to know your brand name can be a tall order. That’s one reason why it’s easy to root for Glendalough Distillery. Founded in 2011 by five friends from Dublin and Wicklow, the microdistillery opened its doors right around the time that the last independent distillery in Ireland was sold to a multinational corporation. That makes Glendalough the first modern craft distillery in the Emerald Isle – a fairly remarkable claim in a country with a centuries-long history of distillation. I first became familiar with Glendalough’s spirits earlier this year, when I met co-owner and brand manager Donal O’Gallachoir. And that’s probably how a lot of people got introduced to Glendalough. You’re unlikely to see a big, glitzy Glendalough ad campaign anytime soon, but you do stand a fair chance of running into the U.S.-based O’Gallachoir somewhere around town. Donal’s a charismatic chap with an inexhaustible supply of entertaining stories, a passion for Irish whiskey, and great pride in his distillery’s spirits. His enthusiasm is infectious and has likely played no small part in Glendalough’s growing popularity. You can now find it in 14 states and countless Boston-area bars. Last week I had a chance to get further acquainted with Glendalough’s spirits during a whiskey dinner at Brass Union in Somerville. Pairing the distillery’s three whiskey offerings with specially prepared dishes, the event served to showcase not only the spirits but also the cocktail and culinary acumen of Brass Union beverage director Paulo Pereira and chef Jonathan Kopacz, respectively. Paulo whips up drinks while Donal looks on. We’ll take it one course at a time. “We’re trying to bring fun back to the spirit of distillation,” Donal said at one point during the evening. While he was talking about the booze production process, it’s a sentiment that could have applied to the dinner itself. And nowhere was that more evident than in the “amuse” course. 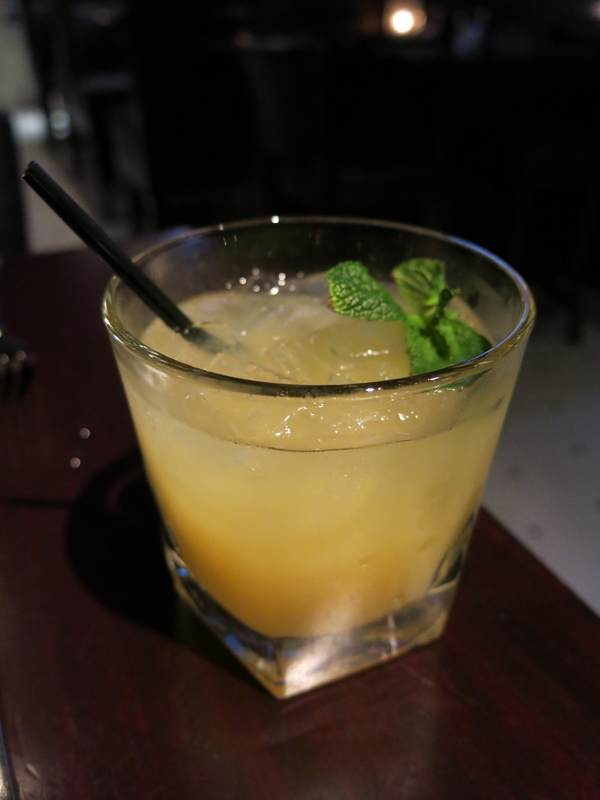 The proceedings began with Glendalough Double Barrel Punch, made with Glendalough’s signature whiskey, a mix of orange, lemon, and pineapple juices, and sparkling water. Refreshing and effervescent, with a pleasant aroma from a mint leaf, it was well suited to the unusually warm fall evening. Paired with the punch was whiskey caramel corn, a sweet, crunchy treat that incorporated Glendalough’s whiskey into the gooey coating. I’d say this was a pretty clever way to start the evening. A whiskey and food pairing might seem like a serious affair, the sort of thing attended by whiskey snobs and highbrow foodies. But opening with popcorn and punch established a playful tone, encouraging guests to focus as much on enjoying themselves and sharing the experience as on appreciating the complexity and flavor interactions of the food and spirits. The first course was a dish of roasted peaches served with goat cheese and a savory honey. Combining sweet, savory, and tangy flavors on one plate, it was light and beautifully presented. Accompanying the peaches was one of the evening’s first surprises – the premiere of a cocktail that Paulo’s been aging in a rum barrel that was later used for a Jack’s Abby porter. The cocktail, called Lane’s Burrow, was a variation on the classic Irish Tipperary and made with Glendalough’s Double Barrel whiskey, Carpano Antica sweet vermouth, yellow chartreuse, and Bittermens Boston Bittahs (their spelling, not mine). It was an unusual cocktail – complex and bitter, with notes of licorice in the middle, but smooth as silk and a smart complement to the peach dish. You may be seeing more of that cocktail, and not just at Brass Union. Paulo bought the barrel from Donal, but since it was much larger than what he’d ordinarily use for aging a cocktail, he invited several other bars in the same restaurant group to go in on the purchase. The Lane’s Burrow will be aged a little longer, but should be available later this fall. Having never had quail (aside from their eggs), I was excited about the second course. Served with radicchio and cherry mostarda, this grilled bird was delicate but rich, with a crispy skin. Paired with it was Glendalough’s 7-year, single-malt Irish whiskey. This is a big, rich whiskey with notes of chocolate, butterscotch, cinnamon, and pepper, and those sweet and spicy flavors elevated the flavors on the plate. Now what would a proper whiskey tasting be without gin? OK, it’s an unconventional move. But then, the surprise guest of the “intermezzo” course, Glendalough’s Wild Autumn Botanical gin, is an unconventional gin. Incorporating upwards of 20 wild Irish botanicals and made in collaboration with a local botanist, it has a completely foreign aroma and a complex flavor profile unlike any gin I’ve tasted. Paolo used it in a straightforward cocktail that allowed the botanical blend to shine, mixing it with simple syrup and charred grapefruit (along with a cryptic flavor orb, which I’m at odds to describe). I love the idea of a seasonal gin, and given New Englanders’ fondness for autumn, this one should win its share of local fans. Unfortunately, it was just a tease; Glendalough’s gins aren’t yet available in the U.S. and won’t reach our shores until next year. It was back to whiskey for the third course. In every respect, Glendalough’s 13-year, single-malt Irish whiskey is the most distinguished of the distillery’s offerings. It took home two awards from this year’s San Francisco World Spirits Competition – Best Single-Malt Irish Whiskey and Best Irish Whiskey. I’d say that puts it in some pretty elite company. And it’s easy to see why the judges in San Francisco favored it – with notes of vanilla, citrus, spices, and oak, this smooth whiskey is similar to a fine cognac, with a robust mouthfeel and a complex bouquet of flavors. Served alongside it was braised lamb served with chickpeas, cucumber, mint, shallot, and lemon. Twenty-four hours of braising resulted in meat that was melt-in-your-mouth tender. The soft texture and bold flavor made it the perfect companion to the exceptional whiskey. 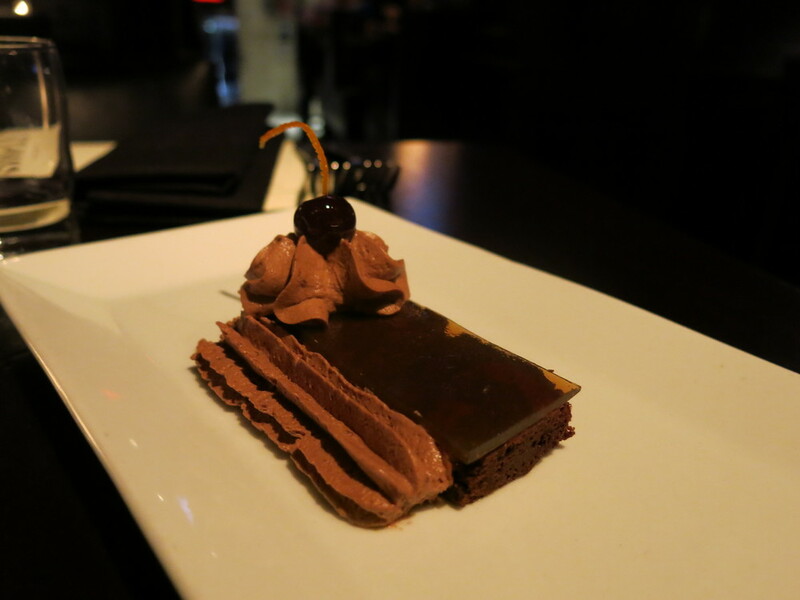 Wrapping things up was a flourless chocolate torte with chocolate cherry mousse. Rich, dense, and decadent, its liquid accompaniment is probably no surprise. The modern Irish coffee may be most famously associated with San Francisco’s Buena Vista Café, but Ireland is still its ancestral home. For this event, Paulo created a traditional Irish coffee with a Portuguese twist – Glendalough Double Barrel, topped with an Irish whiskey cream and a pinch of spice, and Brandymel, a honey brandy from Portugal, in place of the sugar. The brandy added a more complex dimension than sugar would have, and along with the torte, made for a sweet conclusion to the evening. One of the things I personally found most interesting about this whole shebang is the ways in which whiskey can interact with food. I usually don’t pair whiskey with anything other than the occasional cigar, and I was impressed with the way in which chef Kopacz matched the nuanced flavors of the whiskey with some pretty creative food choices. I was also impressed with the versatility of Glendalough’s whiskies, both in the food pairings and in cocktails. 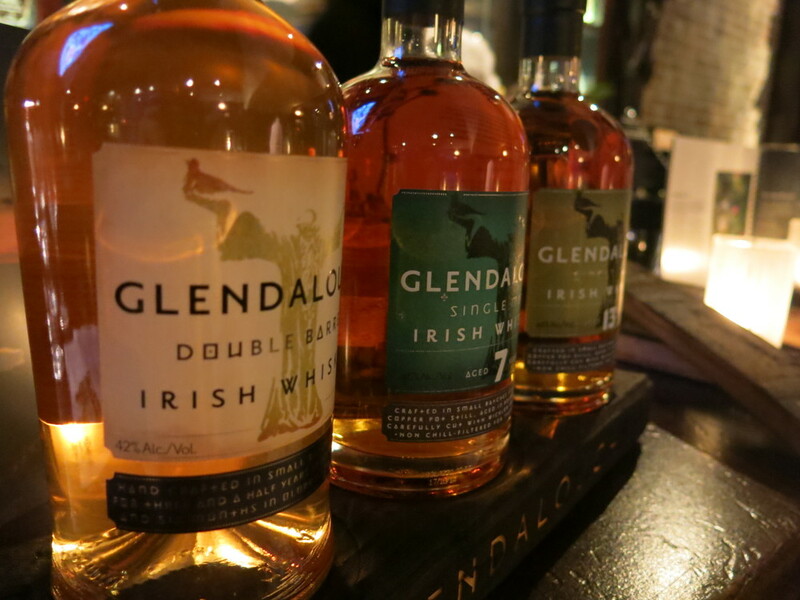 Glendalough might not move 5 million cases a year like the aforementioned green-bottled whiskey, but with a few international awards to their credit and a growing product line, it’s a pleasure to watch this small Irish distillery continue to make a name for itself. And look for a story on Brass Union sometime within the next month or two. I’ve been there twice, but each time has been for a specific event. I can’t wait to sit at the bar sometime and see what else Paulo’s got up his sleeve.